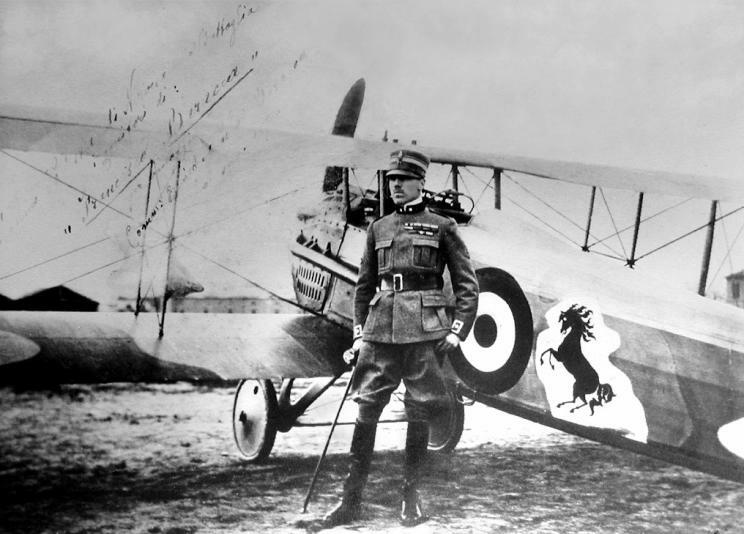 Italian ace of aces count Francisco Baracca, posing in front of his SPAD. Italy was at war in February 1915, swapping side of the entente almost at the last minute after some territorial promises. Previously due to its position just south of the Central powers, it was likely to fall in this side. Italy fought most of the war against Austria-Hungary on its northern, Alpine frontier, a harsh mountain war, but also the hilly north-east and the Venetian region, as well as the Adriatic. Naval aviation played an important part in these operations. Industrial capacities of Italy at that time, still largely concentrated in the North could not cope with the demands of war, but three main manufacturers emerged and soon rose to levels of production that were able to fill the needs of the Italian Air Force (Corpo Aeronautico Militare) during these three years of fighting. During the war, the CAM or aeronautical branch of the army, essentially used SPAD S.VII, Hanriot HD.1, Nieuport 11 as fighters, since local fighter production was very limited (The Ansaldo Balilla was the only valuable model for interception but was used for reconnaissance), and the Pomilio PE and Ansaldo SVA. Macchi was then more renown for its hydroplanes, while Ansaldo bombers became so popular, they were also exported and used by other air forces. Italy also had its own aces: Count Francesco Bacarra to start with (34 confirmed victories), the inventor of the famous "cavallino rampante" used after the war by his friend and admirator, young Enzo ferrari on his first Alfa-Romeo sportcars in races, Silvio Scaroni (26), Pier Ruggero Piccio (24), Flavio Baracchini (21), Fulco Ruffo di Calabria (20), Marziale Cerutti (17), Ferruccio Ranza (17) or Luigi Olivari (12). For the entire war, on this front, Italy scored 643 victories. Most notable unit was 91a Squadriglia, called the "squadron of aces". Total aircraft production in Italy amounted to 12,000, mostly reconnaissance planes and bombers, considerable efforts were focused on the failed development of the SIA 7, and basically wasted whereas a development of some Ansaldo models into fighters could have been proven much more useful. The only "Italian" fighter was the Nieuport-Macchi produced in several series over the years, culminated with the N17. Only the Macchi M.14 which flew in 1918 was a promising fighter development. But the Ansaldo A.1 Balilla was Italy's only fighter in number by late 1918, although a droplet compared to foreign planes. Moreover, because they were few in numbers and pilots were not trained for it, the Ballila were kept away from the front lines, assigned to home defence duties, so its combat value is difficult to estimate. In any case, 186 were operational at V day. The Italian theater saw also not only foreign planes but also entire units, fro the French and British air branches as well. Early on French aircraft had been brought to defend Venice. Following the Battle of Caporetto, four squadrons of the British RFC were sent to Italy as a reinforcement to the Italian squadrons. Meanwhile the Austro-Hungarians suffered shortages tht gradually hampered, then severely limited its operations over the front especially in the Winter of 1917. These RFC squadrons claimed no less than 550 victories for 2017 alone in this theater. But soon, the Austro-Hungarian air forces were bolster by the arrival of considerable German reinforcements after the fall of Russia and revolution. The Winter of 1917–1918 saw few operations, and the air was mostly dominated by the entente. Marchetti MVT (1919), developed before the end of the war. Alessandro Marchetti (1884–1966) will have a tremendous career which lasted until the cold war, an Italian engineer and airplane designer born in Sesto Calende and best known for the WW2 Savoia-Marchetti SM.79, certainly the best World War II Italian bomber aircraft. Back in WW1 he designed the MVT (for "Marchetti-Vickers-Terni"). This was a single-seat fighter made entirely in metal. The fuselage was suspended between wings and the rear fuselage flattened as an airfoil. It also had thin-section semi-elliptical wings, still using wing warping and rear all-moving tail surfaces. An SPA 6a water-cooled engine giving 164 kilowatts (220 horsepower) gave at top speed of 250 kph (155 mph). Armament consisted in a two 7.7 mm (0.303-inch) Vickers machine guns, synchronized. Despite the fact the plane only flew after the war in 1919, it was planned and studied, drawn when the war was still ongoing. Vickers-Terni at La Spezia was charged to built the MVT. which on 9 December 1919 reached an unofficial world speed record. It was redesigned in 1920 with a longer span, splayed interplane bracing struts, modified cabane structure and SPA 62a, 234 kilowatts (285 horsepower) engine. It reached 275 kph (171 mph). Marchetti joined SIAI firm in 1922. Renamed SIAI S.50 failed to mer the Regia Aeronautica 1923 single-seat fighter contest which asked for a 300-horsepower engine. However 12 were ordered for evaluation (and apparently dropped), but his led to the development of the SIAI S.52 fighter. The original company was founded in 1915 as SIAI (Società Idrovolanti Alta Italia) based in Northern Italy) and only acquired the name Savoia after the war, when acquiring the Società Anonima Costruzioni Aeronautiche Savoia, founded by Umberto Savoia in 1915. Marchetti was added in 1922 and the company was made famous for its seaplanes during the interwar and WW2. The company produced the SIAI S.8 floatplane from 1917 (214 built), and S.9 in 1918 (about 350). In association with Pomilio, it also produced a serie of reconnaissance planes derived from the Farman Mf.11. The SP.1 from Umberto Savoia and Ottorino Pomilio was a prototype of a modified copy of the Farman MF.11 then built by Savoia as SIA 5b, Followed by the SP.2 in 1916 (300), SP.3 in 1917 (350) and SP.4 in 1917 (150). FIAT A.12 engine. In 1908, aeronautical production started at Fiat in Turin,with the desire to produce an aircraft engine, aside sports-cars, since planes were then the new sport craze. The SA 8/75 engine was therefore derived from a racing car unit. This Fiat engine was later derived as the lass-produced A10, delivering about 1,070 of these between 1914 and 1915. However when the war broke out, it was considered the pioneer age had come to an end and aviation was a booming industry that led to re-organize and rename the company from 1916 "Società Italiana Aviazione" (SIA) and embarked in the design and construct of a complete aircraft. The company changed its name again in 1918 to Fiat. 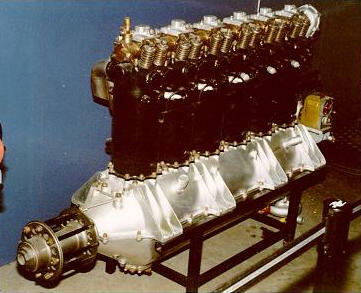 It would produced the A.10 6-cylinder, liquid-cooled, in-line aero engine (about 15,000), succeeded by the larger A.12 (1916), same configuration but with with a bore of 160 mm, stroke of 180 mm,for 22 liters. It was able to produce between 245 and 300 horsepower at 1,700 rpm. Over 13,260 engines were delivered during the war and until 1919. It propelled all Italian planes but also the French Breguet 14 and British Airco DH.4, Airco DH.9 and even the Vickers Vimy prototype. It was large and heavy, more of a marine engine, but reliable. The FIA A.14 appeared in the end of 1917 but was more costly and heavy, with only 500 built. It was a V12 intended for heavy bombers, and was the largest and most powerful aircraft engine in the world, able to deliver a gargantuan 725 hp, but the war ended its lineage. 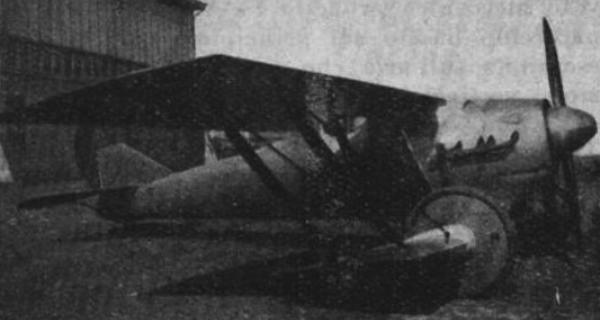 It propelled the SIA 9B, postwar Macchi M.19 race floatplane and 1919 Fiat B.R. 1/4. The next A.15 was a project, replaced in 1920 by the A.20, still a V12 but lighter and more manageable, and the serie went on for the next twenty years. This prototype fighter was studied at the end of 1918 by engineer Tebaldi. He designed the Tebaldi-Zari (in association with the Industrialists Zari brothers), a single-seat wooden sesquiplane fighter characterized by heavily staggered wings. It was propelled by a 142 kW (190 hp) Isotta Fraschini V.6, water-cooled 6-cylinder in-line engine. But the fixed tailskid landing gear was very unusual as it had a very wide track and impressively oversized main wheels which axle was incorporated directly into the lower wing. The plane was to be produced as a private venture, expecting to meet fighter requirements by the Zari brothers factory in Bovisio Mombello, Milan. They created the prototype in early 1919, which apparently first flew in early 1919. Breda had knowledge of it, and soon bought the prototype and the design rights. The company Breda the replaced the engine by a more capable 224 kW (300 hp) Hispano-Suiza HS-42 V-8 water-cooled engine. In 1922 Breda wrote an agreement with the Italian government to produce three more prototypes, but no production followed. Breda then modified it with two fixed 7.7 mm (0.303 in) Vickers machine-guns, and the upper wing with a longer span and narrower chord. The wing stagger was also reduced, the gap between the upper wing and fuselage was widened, as well as the angle of the outer struts, connected the axle of the main wheels. The outer wing panels were removed for tests. Later Breda increased the size of the ailerons and the chord of the upper wing while the outer panels of the lower wing were removed. The newly modified Tebaldi-Zari entered in the Italian 1923 fighter contest but it failed to attract any production order.